"On June 17, Zune will release a limited edition, Joy Division-themed 80GB media player designed by legendary Factory Records artist Peter Saville and we've got the exclusive, never-before-seen photo of the special device, pictured above. Click here for a larger image. The Zune player, which utilizes an adaptation of Saville's artwork for Joy Division's Unknown Pleasures, will honor the DVD release of Joy Division, a much-anticipated documentary chronicling the life of the influential but short-lived Brit post-punkers. The film will be preloaded into the special edition player." 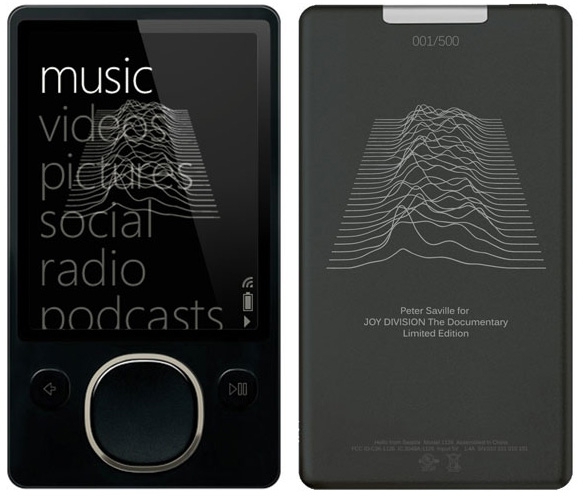 ""Zune's involvement with the Joy Division documentary is a way of saying 'Thank You' to the band for doing what they did, and is not only a tribute to them but to an entire musical journey through Factory Records and the artists and movements it spawned...It's a tribute to deep respect for graphic design that lives on through artists like Peter Saville, and to independent film-makers that believe in more than just commercial success. Ultimately it's a tribute to the self-belief and self-expression that inspires true authentic art." Seems like Joy Division is a big deal to some people!